From airplanes to storms, moons to sunsets, all the way to an exciting new job with my new employer NBC10Boston/NECN/TELEMUNDO. These photos span from January 4, 2018, a Winthrop storm photo, to December 31, a newly married couple posing for a wedding photo at FirstNightBoston. My new career started on November 12. I am proud to say that there are 8 photos taken after November 12. Thank you all for your support. Happy New Year! March 2018, Boston,MA. 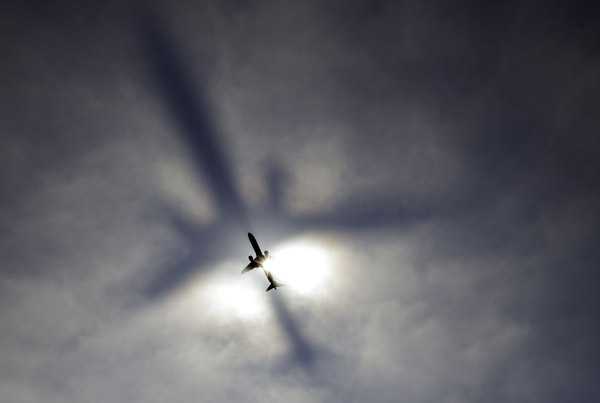 An airliner approaches Boston’s Logan airport. April 6, 2018. Snow and fog at Logan. December 4, 2018-Parking lot of NBC10Boston. A departing airliner through my view of the crescent moon. January 7, 2018. At 40,000′ high, this Lufthansa airplane flies through my view of the sun as they fly to NYC from Germany.Photographed from Winthrop,MA. January 5, 2018. Wind and blowing snow at Logan. May 21, 2018.Long lens compression makes this Logan departure look as if it is a hood ornament atop the Pru. June 30, 2018. Harbor fireworks. December 5, 2018. A construction crane atop One Dalton, Boston’s newest high-rise, frames the rising crescent moon. January 31, 2018-Hull,MA. 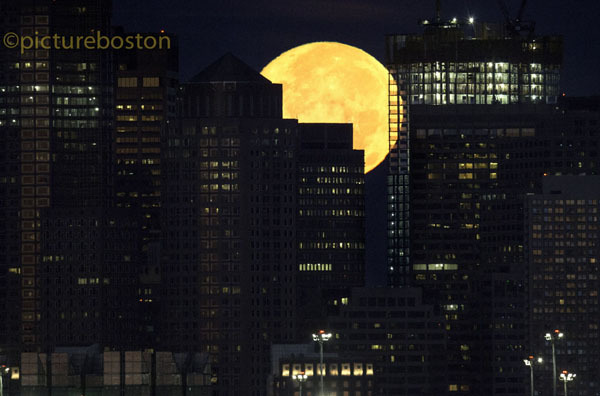 A special lunar trifecta ends with the moon setting over Boston, as seen from Hull, shortly before 7am. The second full moon of this month, called a Blue Moon, and a close pass to earth called a Supermoon, along with a partial lunar eclipse will not happen again until 2037. December 8, 2018. The setting Boston crescent moon. 03/01/2018-Boston,MA. This morning’s moon is framed by the Chelsea Street Bridge, and the new (under-construction) casino, in middle, as it sets over Constitution Beach in East Boston. December 12, 2018. Mourning Dove with Crescent moon. September 4, 2018. The crescent moon, a bird, and Boston’s North End. February 17, 2018-Revere,MA. Revere and area firefighters battle a 5 alarm fire at 61 Squire rd, Sozio Appliances. January 16, 2018-Dorchester,MA. Boston firefighters work the scene of a 4 alarm fire at Codman Square Market and Mod Liquors, at the 500 block of Washington St. Firefighters needed foam to squash the fire. The foam accumulated on Washington St.
BOSTON, MA. – August 8: Lightning strikes over a foggy Deer Island as a series of vivid lightning storms visited Boston, on August 8, 2018. BOSTON, MA. – August 8: Lightning strikes over South Boston as a series of vivid lightning storms visited Boston, on August 8, 2018. August 4, 2018. 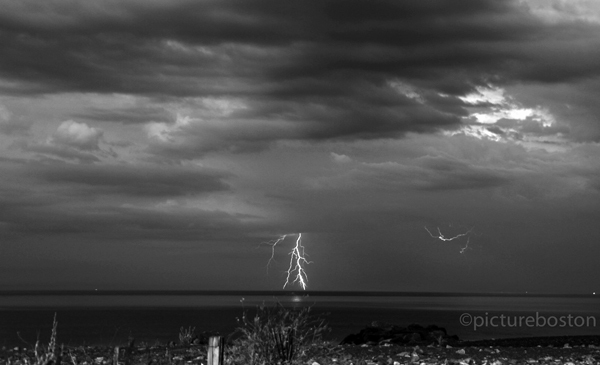 A thunderstorm of Cape Cod is seen from Winthrop,MA. 03/02/2018-Winthrop,MA. A driver abandons her car on Moore St., at Shirley St., after driving through during the height of today’s high tide. BOSTON,MA. – August 3: Lightning strikes over and to the rear of Logan airport early afternoon, on August 3, 2018. 03/02/2018-Winthrop,MA. A car sits stuck in the water as the high tide pushes up and over the seawall at Short Beach, on the Revere/Winthrop line. 03/02/2018-Winthrop,MA. The high tide pushes up and over the seawall at Short Beach, on the Revere/Winthrop line. 01/04/2018-Winthrop,MA. Joey Constantino peers out the window of his Shirley St. residence as heavy seas inundated his neighborhood. 03/02/2018-Winthrop,MA. A fire truck pushes through Shirley St., during the height of today’s high tide. 01/04/2018-Winthrop,MA. A Town of Winthrop fire truck sits stuck in water from heavy seas that inundated the Shirley St. neighborhood. September 5, 2018. Our son Leo takes flight. 03/17/2018-Revere,MA. Participants, of all kinds, are seen at the annual, and frigid, Revere Polar Plunge this afternoon at Revere Beach. The annual plunge benefits Special Olympics Massachusetts, and is helped along by the Law Enforcement Torch Run for Special Olympic Massachusetts. February 20, 2018. 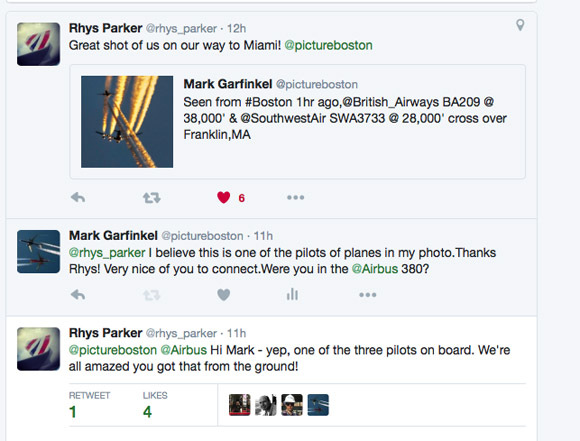 A father teaches his aviation-loving boys how to photograph passing jetliners near Logan airport. April 7, 2018. Belle Isle Marsh Revere. July 4, 2018. The Queen Mary pulls into Boston Harbor. September 18, 2018. Boston sunset. December 10, 2018. Newton firefighters salute as the body of fallen FF Christopher Roy passes below them on the Mass pike. December 31, 2018. Newly weds pose for their wedding photographer in Copley Square. A few requests for me to repost this—-> Photographing the Solar Eclipse with a twist: The world’s largest passenger plane. I was not planning on spending too much time, or thought, on today’s Solar Eclipse, due to a wrist fracture that I sustained covering the controversial protests on Boston Common two days ago. I decided I would try to set up my heavy gear in my Winthrop,MA driveway. With some help from my neighbor Ron, my set up of a Canon 800mm lens and a large tripod was complete with seconds to spare before the solar show. Stuart Cahill, a colleague of mine at the Boston Herald newspaper, had already made me an improvised solar filter for my large lens, and I had already obtained nerdy solar glasses for my eyes. I was amazed at how good the filter worked on my lens. I started to shoot photos every 4 minutes, or so, and was excited with what I had. There was one thing that I really wanted, though. I had expected that there would be an opportunity to get a high altitude airliner through the sun, or more correctly stated, through my view of the sun. I was not disappointed, though it came very late in the eclipse, and did just barely sneak into my view of the sun. I watched as one after another high altitude airliner, most flying from Europe to NYC, just missed the sun. I remember thinking that I wished air traffic controllers in Nashua,NH., would turn them just a little for me. It was getting late and clouds and haze were moving in front of my view of the sun. I noticed the flight tracking systems that I use, flightradar24 and planefinder, were showing an Airbus A380, the world’s largest passenger plane, over the Massachusetts/NH border, and heading my way. The plane was at a flight level of 40,000′ and traveling at 446 knots. The Etihad Airlines plane was flying from Abu Dahbi to New York city. It was almost directly over Tufts University when I watched as the plane disappeared into the blinding rays of the sun. I shot a heavy handed burst of several photos. I only knew of my success as I looked at the back of the Canon digital camera a few seconds after the moment of impact. The spots on the sun are not dust, they are sun spots, or storms on the sun itself as I understand it. This was a once in a lifetime photo for me, on a couple of fronts. First, and most important, was the rarity of today’s solar eclipse. Second, this is the first time I have photographed an airplane thru the sun, as I usually concentrate my aviation photography on the moon and an airplane, as seen in my aviation photo link above. Also, this is the first time I have captured the A380 thru the sun or the moon. The sky is black due to the heavy filter I was using to safely photograph the sun. One of the world’s largest airplanes departs Boston’s Logan Airport today. The Antonov Design Bureau AN124, a Ukrainian cargo plane with a tail # UR-82008, is seen departing Boston’s Logan International Airport after a surprise and brief refueling stop prior to a flight to the NASA Shuttle Landing Facility (Titusville). My photos from early this morning. World’s largest airliner, Emirates Airbus A-380, lands in Boston. The Emirates Airbus 380 landed at Boston’s Logan International airport, Thursday January 26. It was billed as a “one-off” according to a tweet by the airline. The airport has renovated a section of Terminal E, their international terminal, so that the tall, double-decker aircraft can fit properly. Here are my photos of the arrival and departure. Lenses used were a Canon 800mm and a 100-400mm. Posted in Uncategorized | Comments Off on World’s largest airliner, Emirates Airbus A-380, lands in Boston. I was a witness to many memorable events in 2016, from several nasty building fires, to extreme weather, to a tragic trench collapse. Here are some of these moments. Photos taken on and off my Boston Herald news photographer shift. Thank you to the Herald, and to my subjects, many of whom are first responders. December 16, 2016-Boston,MA. Firefighters battle fire and ice during this morning’s frigid 6 alarm fire in Boston’s Charlestown neighborhood. ABOVE: 04/28/2016-Boston,MA. A Boston firefighter stretches a hose toward a large brush fire in the Fenway section of the city, at the rear of City of Boston’s fire alarm office. ABOVE: October 21, 2016-Boston,MA. Construction worker Steven Smith pleads for help from others shortly after two workers were buried under water and soot as a trench collapse and water leak filled the hole they were working in on Boston’s Dartmouth St., Friday afternoon. The two workers were killed. ABOVE: 07/14/2016. The evening commute, Boston Logan style. ABOVE: 05/19/2016-Boston,MA. The ocean liner Anthem of the Seas enters Boston Harbor, just after Thursday morning’s sunrise. ABOVE: 04/21/2016-Winthrop,MA The sunrises as the moon sets over the city of Boston. ABOVE: 02/24/2016-Boston,MA Boston EMS’ Manuel Tejeda helps the victim of a car accident on D St. ABOVE: 07/26/2016-Boston,MA. 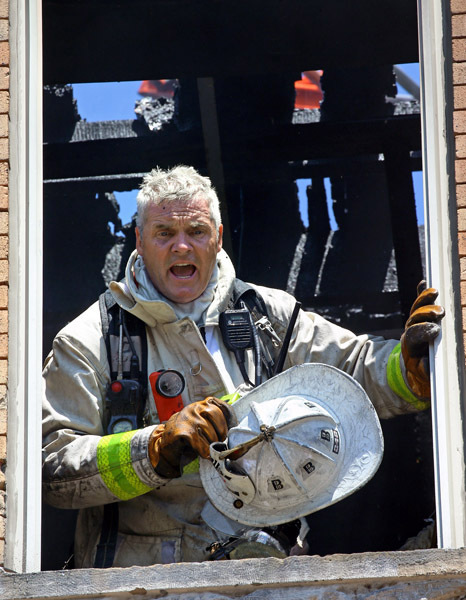 A Boston firefighter takes a breather at Tuesday afternoon’s multiple alarm fire at 87 Sawyer Ave. in Dorchester. ABOVE: 06/04/2016. Belmont,MA A turkey strolls along Belmont Hill. ABOVE: 07/26/2016-Boston,MA. A tenant of 87 Sawyer Ave. in Dorchester, arrives home in tears, as her home burns Tuesday afternoon. ABOVE: 06/01/2016-Winthrop,MA The very large Antonov 124 cargo plane, soars over Boston. ABOVE: 09/08/2016-Winthrop,MA A Hummingbird Moth is seen tonight, refueling on some plants. ABOVE: 07/20/2016-Boston,MA Boston Light frames tonight’s Super Moon rising. ABOVE: 12/14/2016-Winthrop,MA. A high altitude airliner flying from Newark to Stockholm flies through a thin layer of haze as tonight’s moon rises. The plane was traveling at 605 knots and at 32,000′. ABOVE: 03/30/2016-Boston,MA Morning departure from Boston’s Logan airport as the moon sets in the background. ABOVE: 09/16/2016-Boston,MA. The full Harvest moon rises over Boston Harbor’s Graves Light Friday evening. ABOVE: 11/30/2016-Boston,MA. A man navigates Knapp St.in Boston’s Chinatown neighborhood after a water main break flooded the area, shortly after 5:30am Wednesday morning. The Boston Water & Sewer Commission was in the process of shutting down the leak at 6am. ABOVE: 12/03/2016-Cambridge,MA. Cambridge and surrounding fire departments battle a ten alarm fire on and around Berkshire street, Saturday afternoon. ABOVE: 07/21/2016-Boston,MA. Boston firefighters work at the scene of a 6-alarm fire on Bunker Hill St. in Charlestown, Thursday afternoon. ABOVE: 12/06/2016-Malden,MA. Firefighters work at a 3 alarm fire at 381 Medford St. late Tuesday morning. ABOVE: 03/05/16-Boston,MA A worker from a restoration/cleaning company is seen inside a fire-damaged apartment at 380 Talbot Ave. Saturday morning, hours after a fire killed a resident there. ABOVE: 07/23/2016-Winthrop,MA A severe thunderstorm exits the coast at Winthrop Shore Drive after doing damage to homes, cars, and many trees. ABOVE: 11/23/2016-Boston,MA. Boston Police, Fire, and EMS personnel work to make comfortable, and then to eventually rescue, this distraught man threatening to jump from a ledge at the MIT Frat house at Commonwealth Ave., and Hereford St., Wednesday afternoon. ABOVE: 08/14/2016-Winthrop,MA A split-second burst of several lightning bolts is seen over Graves Light during an early morning thunderstorm. ABOVE: 12/15/2016-Stoneham,MA. Firefighters work at the scene of a 2 alarm fire at 154 North St., late Thursday morning. ABOVE: 12/16/2016-Boston,MA. Firefighters battle fire and ice during this morning’s frigid 6 alarm fire in Boston’s Charlestown neighborhood. ABOVE: 03/18/2016. Winthrop,MA. Winter surfing. ABOVE: 03/26/2016-Boston,MA. Mayor Martin J. Walsh poses for a photo with 6 year old twins Aiden, at left, and Austin, prior to the annual Sisters of Saint Joseph Easter Egg Roll in Brighton, Saturday morning. ABOVE: 11/17/2016-East Boston. Birds of a feather. ABOVE: 02/14/2016-Winthrop,MA. Seasmoke rises above the Atlantic as Boston temperatures dipped to several degrees fahrenheit below zero Sunday morning. 3000′ separation miles over Boston, as two “ships” pass in the evening. There is magic above, just look up. Lot Airlines flight LO26, Warsaw-NYC (JFK), flying at 37,975′ passes United Airlines flight UA999, JFK-Brussels, which is at 34,975′. I photographed this at 7:34pm tonight, from my driveway in Winthrop. Scroll down for the very cool radar readout, courtesy of the very awesome planefinder.net. Posted in Uncategorized | Comments Off on 3000′ separation miles over Boston, as two “ships” pass in the evening. Boston moons, airplanes, lightning, weather: Part of my year in photos 2015. Boston moons, airplanes, lightning, weather: Part of my year in photos 2015 included high altitude jets, severe thunderstorms, rising and setting moons, etc. For the News Photography part of my photos of 2015, please click here. I used a Canon 1Dx camera and Canon lenses 800mm lens, a 100-400mm lens and sometimes a 1.4 extender. May 1-Moon appears tonight as SWISS FL LX52 approaches BostonLogan shortly before sunset. February 27-Shadows over Boston, as the massive Emirates Airbus A380, Flight EK204, JFK-Dubai, A6-EDM, is seen. 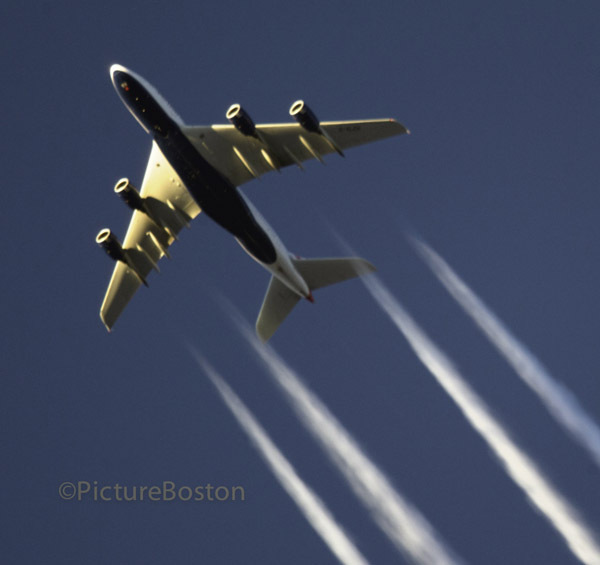 April 13-World’s largest passenger jet over Boston today as lufthansa Airbus 380 flies JFK-Frankfurt. 6 miles up. September 22-Boston’s newest hood ornament? A Jet departs Boston Logan. I photographed with an 1120mm lens from Winthrop. 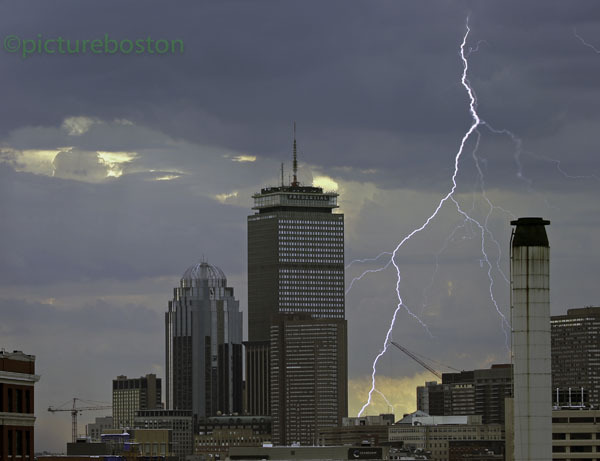 August 15-Lightning strikes behind Boston’s Prudential Center tower at 6:13pm. May 19-Moisture slides, then spins off the wing of an arriving Delta Boeing 757. September 20- Boston half moon with Tap Air Portugal TP204, Newark-Lisbon, caught over Winthrop. Almost 7 MilesHigh. June 26- LOT Airlines, JFK-Warsaw 35,175′ high over Winthrop Massachusetts at 583kts. November 25-A departing from BostonLogan seen from Winthrop as jet crosses in front of Boston full moon. December 19-11:17pm. Shot from Winthrop. Its over Waltham at 34,000′, United Airlines Flight UA924. Washington,DC-London. October 25- Multiple exposure of Boston sunset w/ FedEx Boeing 767 landing at Boston Logan. 01/23/2015-Boston,MA. A high altitude passenger jet crossing in front of tonight’s crescent moon. 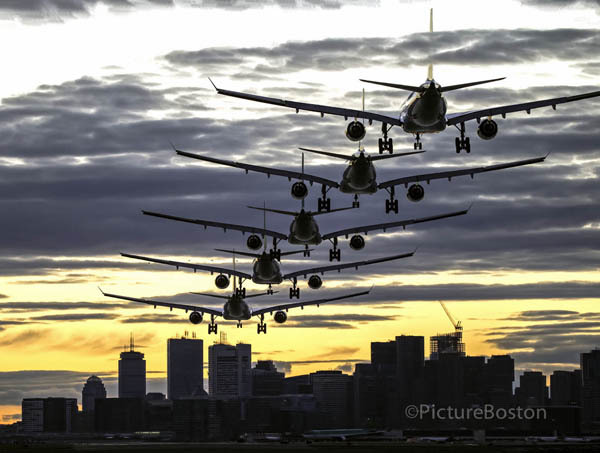 October 19- Multiple exposure of Boston sunset w/ Aer Lingus Airbus A330 landing at Boston Logan. October 10- Boston sunset, as Cape Air heads southbound out of Boston Logan. 09/27/2015-Boston,MA. Tonight’s blood red super moon eclipse is seen at timed intervals. November 25- A ship enters Boston Harbor as the moon rises in background, as seen through an 1120mm lens. 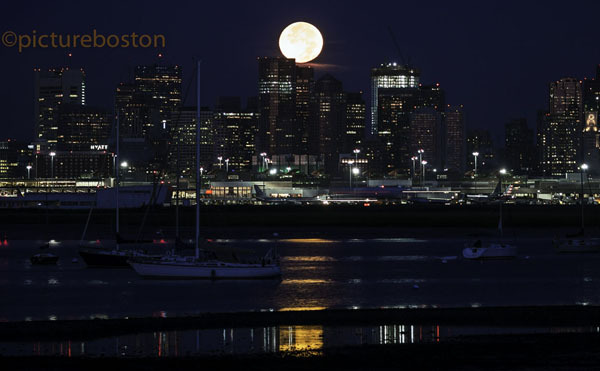 November 25- The morning’s setting moon is seen over Boston at 5:54am from Deer Island. May 19, 2015- Brish Airways landing at Logan, with Winthrop in the foreground. 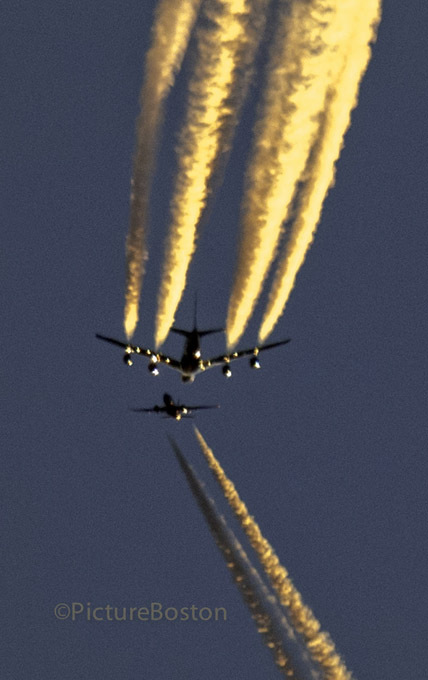 December 5- The massive Airbus A-380, double decker airliner, British Airways BA209 @ 38,000′ over Winthrop. December 5- British Airways BA209 @ 38,000′ & Southwest Airlines SWA3733 @ 28,000′ cross over Franklin,MA., as seen from Winthrop. August 29-Moonset, as I photographed it at 5:36am. 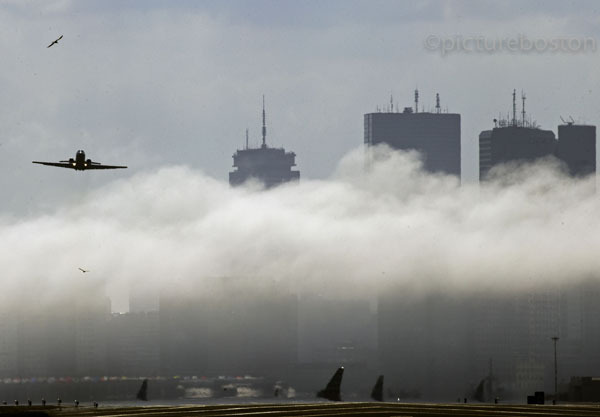 August 20, 2015-Winthrop,MA Low level and wind-whipped fog shrouds a jetliner departing from Boston’s Logan International airport. October 8-Brookline,MA. From Larz Anderson Park. Sunrise with Moon and Venus, 6:10am. It is said that inside every aviation enthusiast is a little child. If that’s true then it must also be true that this “child” writer feels how a kid must feel on Christmas morning. Shortly after 4pm yesterday, while I was browsing the internet, I noticed on the website planefinder.net that one of the largest planes in the world, the Airbus A380 passenger jet, was 7 miles high (38,000′) over the Portsmouth,NH area. The British Airways jet was traveling south and radar showed the trip was from London to Miami. This is a normal everyday occurence over Boston, as hundreds and hundreds of flights exit and enter the east coast in this fashion. 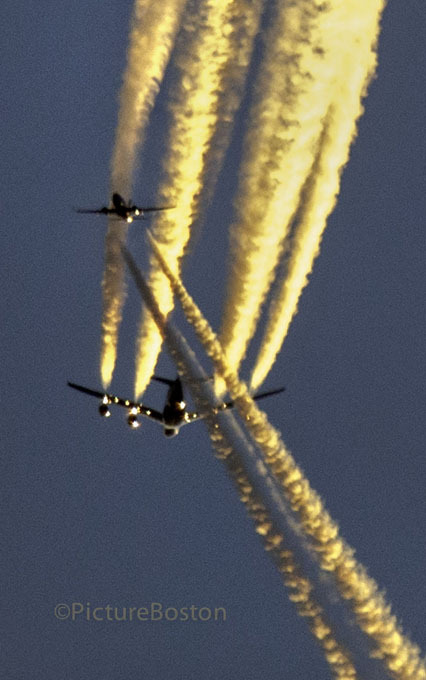 The light was nice and the contrails that these planes produce were large and pluming. I setup a tripod in my driveway in Winthrop,MA. and used a Canon EOS 1DX and a Canon 800mm lens with a 1.4 extender. I waited and at 4:13pm the jet showed itself to be over the North Shore of Boston. I took a few photos and was going to pack up when I noticed a smaller passenger plane, a Southwest 737, from BWI-Portland,ME. heading toward the British Airways jet at 28,000′, or 10,000′ below it. They “crossed” over Franklin,MA., roughly 30 miles away from me. I posted the photos on twitter, with the flight numbers, BA209 and SWA3733. These photos got a good response but when I checked twitter a few minutes before bed last night, there was one twitter message that piqued my interest and gave me a big smile. One of the three crew members that was piloting the massive plane tweeted the following messages, below, after he landed in Miami. Also, please continue to scroll down to see my photos, below. If it is said that aviation brings the world together, and Twitter makes the world smaller, then it must also be said that good old-fashioned manners and friendliness make the world a better place. Peace out! 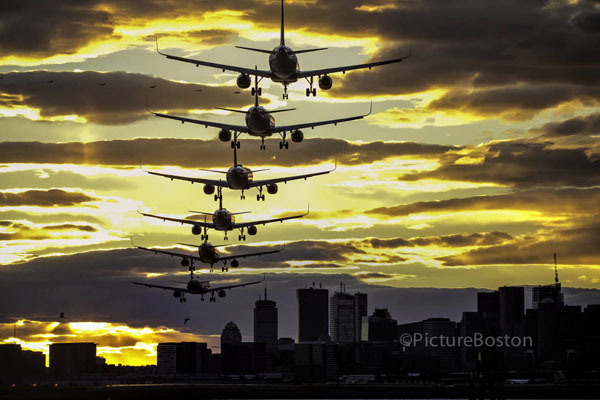 Multiple exposure photography of airliner landing in Boston. How I did it. I have received questions about my settings for this type of photograph. The first photo, at top, was photographed last night, Sunday October 18, at 6:06pm. It is Aer Lingus flight EIN 139, a Dublin to Boston Airbus A330. I used a Canon camera and a 100-400mm lens at 176mm. Speed was ISO/ASA 1000. Shutter speed 1/400th of a second at F5 aperture. I set the camera fire 5 bursts on the same frame. A 5 multiple exposure photo, with each snap at 1.2 second intervals. A tripod is a must as the city skyline will actually be photographed 5 separate, and thus has to be lined up the same each time. The bottom photo, a 6 image multiple exposure, was snapped on Saturday night at 5:49pm. ISO/ASA 320 with a lens of 200mm. Shutter speed of 1/320th of a second at F5, with a 1.5 second interval between snaps. These photo are a lot of fun, especially when the wind kicked up and the jet lands somewhat sideways. Tags: Airbus, aviation, Boston, Canon usa cameras., Logan Airport, Mark Garfinkel, Massachusetts, photography. The natural world dominated my August 2015 photos of the month. I photographed lightning, many moons, and more lightning photos, along with coverage of some tragic violence in our area. As always, thanks for viewing my photos. The following were taken during and after my shift as a Boston Herald photographer. August 20, 2015. Heavy fog over Boston’s Logan airport. August 29, 2015. Boston’s setting moon, at 5:36am. August 29, 2015. Boston’s setting moon, at 5:33am. August 27, 2015. 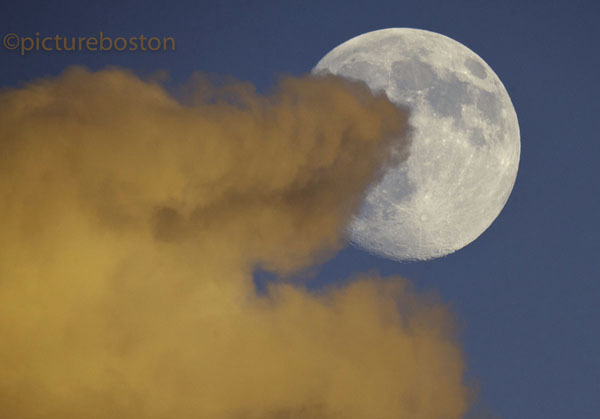 An almost-full Boston moon emerges from behind a colorful cloud at sunset. August 4, 2015. 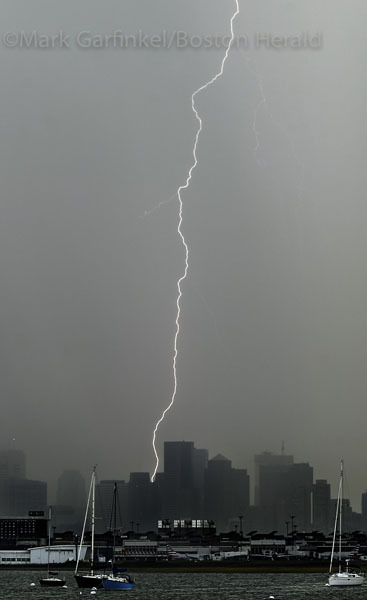 Lightning strikes over Boston’s Financial and Seaport Districts during Tuesday afternoon’s thunderstorm activity. August 18, 2015. 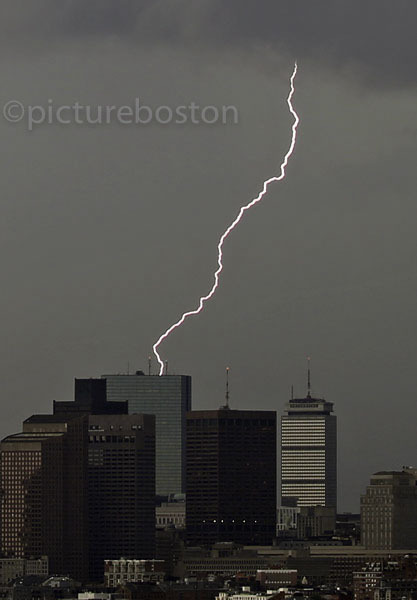 Lightning strikes over and to the rear of 1 International Place in Boston Tuesday afternoon as a line of thunderstorms pushed through. August 15, 2015. 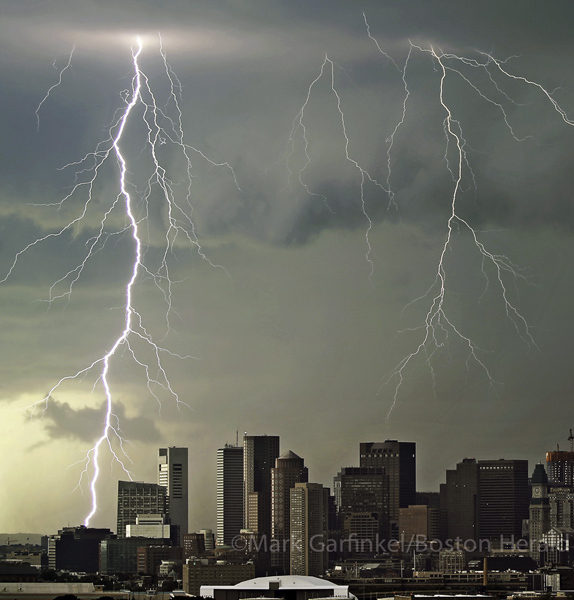 Lightning strikes in back of Boston’s Prudential Center during a late afternoon thunderstorm. August 15, 2015. Lightning strikes over a Winthrop neighborhood. August 15, 2015. Lightning strikes to the rear of South Boston high school. August 4, 2015. 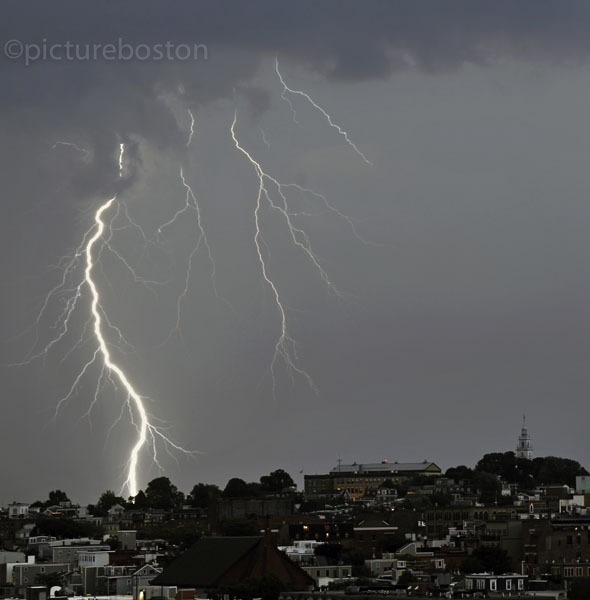 Lightning strikes behind Boston’s Back Bay. August 4, 2015. 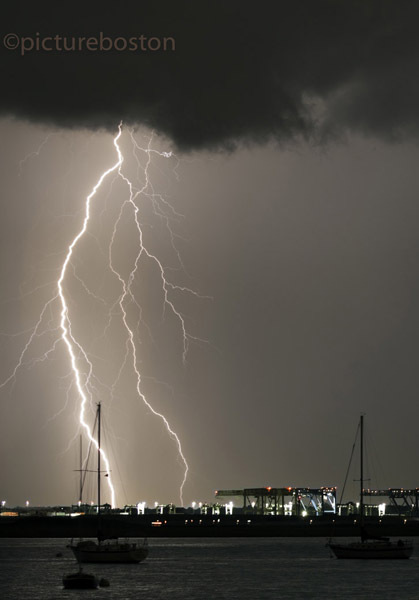 Lightning exits Massachusetts’ coast, between Winthrop and Quincy. August 15, 2015. 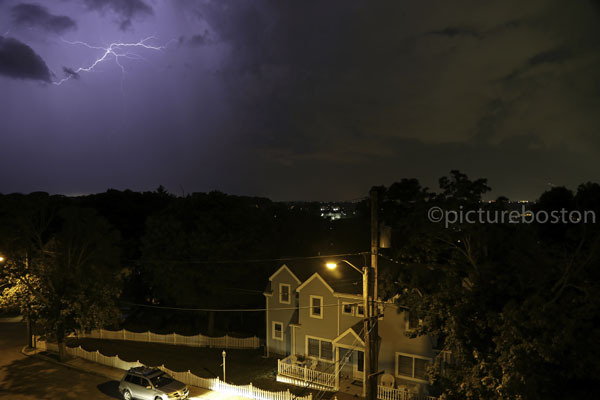 Late night thunderstorm over Dorchester/Quincy, as seen from Winthrop. August 4, 2015. 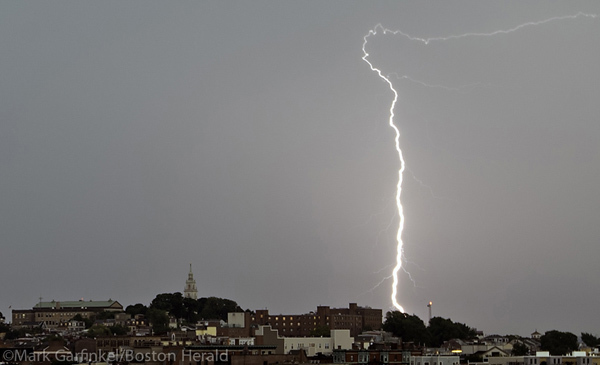 Lightning strikes over South Boston during the morning commute. August 5, 2015. The Winthrop fire department tests a new fire engine as an Air France 747 lands in the background. 08/11/2015-Boston,MA. 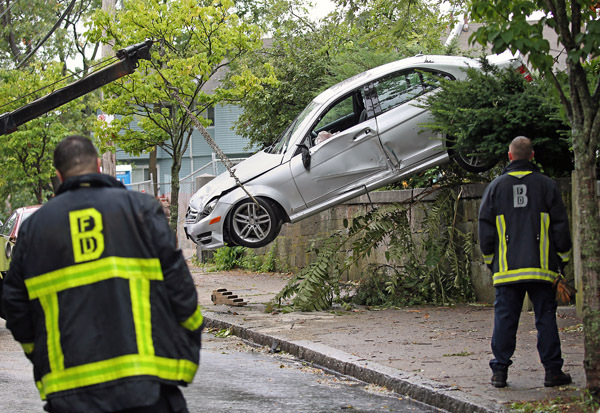 Boston firefighters watch as a car hangs off a driveway onto Roxbury’s Cedar St. Tuesday afternoon. No serious injuries were reported. 08/13/2015-Boston,MA. 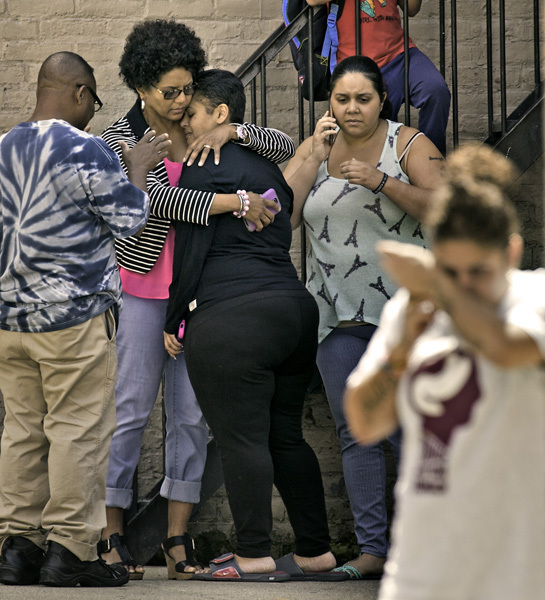 People, believed to be friends and/or relatives of one or both of the men gunned down on Ernst St. last night, console each other Thursday afternoon in that Boston neighborhood. 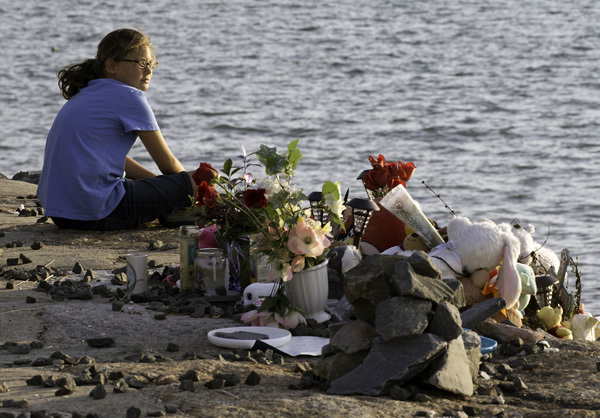 08/29//15-Boston,MA Syla Rapaglia, age 11 years, sits at the makeshift memorial for the child known as Baby Doe, whose body was found at Deer Island on June 25. Skla’s mother organized the 2nd vigil for the missing child, held tonight. 08/07/2015-Boston,MA. Joe Casper, Boston fire dept. acting District Chief, works at the scene of a 3 alarm fire at 6 Waverly St. in Roxbury today. August 20, 2015. 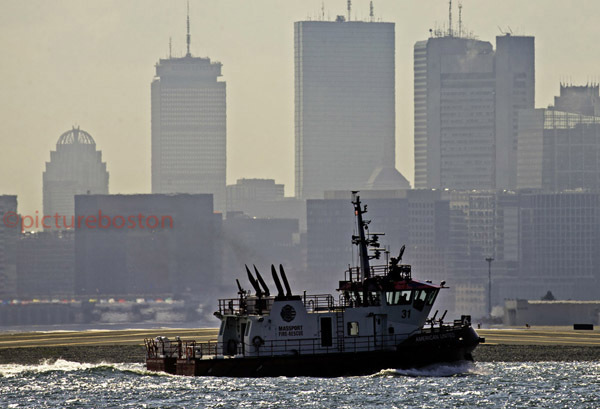 Massport’s fireboat American United in #Boston/Winthrop. Named for 2 airlines in 911 attacks.